Well yesterday we had a terrible time finding our turtles . We retrieved one and the other one was dumped in a ditch somewhere . These two downs syndrome kids (who should have been being watched by their parents instead of an older brother ) stole them out of our pool out front of my cousins house . When approaching the house the older brother told us that their mom or dad was not around and he was having to watch them and he continuely called them stupid . so anyway they returned the little male turtle but then told us they dumped our female turtle into a ditch and she we figure is long gone now sadly to us . Our friend across town has several turtles and she is going to give us one to go along with the male turtle . It just amazes me that not one parent came down here to apologize . I as a parent would be so embarassed if my child did anything like this and I think any parent with a grain of salt should be too . So I know now that when my grandma said that the apple does not fall too far from the tree . I think maybe the parents have stolen and the kids saw it and think it is alright to do so . anyways on a lighter note here guys and gals Denise is having an awesome giveaway again and here is the link to her blog and check it out .Knitting in the Wild - Life on Clear Creek . Let us all be carefull out there among them english . Wow I just realized that some ppl shop for stationery like some ppl shop for clothes !! Oh my gosh I just realized that some people shop for stationery like some ppl shop for clothes . I mean honestly dont we take so much time with our clothes just like we do with stationery . I mean you hold up the paper to the light and we think about how it is going to look , will they like the color , the texture ,the ink ? I mean come on seriously I do think we letter writers subconsciously think about thing like that more than people who are non letter writers . Now pen and ink is a whole other matter and that is best left for another day , so maybe soon I will blog about some certain ink , pen or paper I received as a gift who knows from one day to the next what I will choose to blog about . So hang on for the ride I hope it is not too bumpy for you . Oh well take care and be carefull out there among them english . Well the awesome Miss Pixie over at pixies ponderings is doing a back to school giveaway and halloween fun stuff . 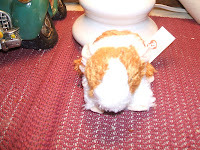 You guys really should take a look at her blog it is called pixie's ponderings at blogspot . she looks like she has quite a good bit of stuff to be parting with . That lady is awesome , I dont know if I could move across the ocean to anywhere , vacation is great and another matter . But going across the pond to live oh my that would have to be a rather throughly thought out decision . Okay I am totally getting away from the point and rambling . Sorry guys I am rambling on . Well have a great day and be carefull out there among those english . 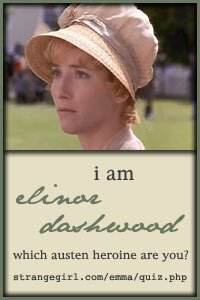 yes that line is from the movie witness with harrison ford and kelly mcgillis . I had a fasination with Harrison Ford at one time and another one of my favorite movies is called Hanover Street with Leslie Anne Down , most of our brittish friends will know who she is . Okay everyone I promise this is it . 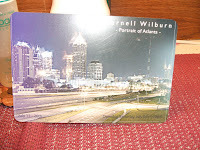 hey all got this awesome post card in the mail today from nancy a penpal from another site . She is awesome and sends the most interesting post cards . I love everything she sends . she has this knack for knowing exactly what I need when I need it . she knows I love boats due to my second husband loving boats so much and his flare for sailing . I sadly lost him way too soon . That was many many yrs ago and another story for another time . I hope you all like this one as much as I do . Okay be carefull out there among them english . Hi there we have a name for the mascot his name is now Sir Richard Nibbles . 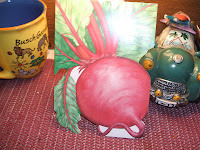 Thanks to my two readers ,sam over at futuristic and zuzu over at her blogger . so there we have it folks . the mascot is now know. Hello dont know if anyone else is having this happen to them but we have a hacker they leave a comment copying a part of your other comments . If I catch this person on my comments section again I will report them to the fcc and wont stop there . So if you are the person who is advertising on our blogs about your work at home opportunitys I will make sure that the fcc tracks you down and I will co operate with the fcc to the fullest extent of the law. Now onto nicer things . at some point this week I am going to post a pic of an interesting picture and see how the rest of my dear readers interpret this picture . More later and please be carefull out there among them english . Hey there everyone well finished another book yesterday titled 'A northern light" by Jennifer Donnelly . 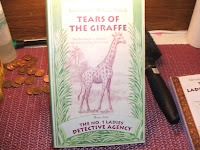 It is loosely based on a for real murder back in the 1900's . It is a really good book. it focuses on small town attitudes and such . I dont want to give too much of the book away so I will let you know it is really good and I throughly enjoyed it . Please pick up a copy cause it is well worth the read . Okay enough for now . Take care all and be carefull out there among them english . Oh my dear patty over at letterip. what a great card !!! I knew from the envelope with the hot air balloon sticker I was going to enjoy what was inside and boy was I right . I guess I will be forever known to her as her sticker doodle do pen pal LOL !!! I love it !!! I love all the foo fa lah . Thanks patty you really brightened my day . be carefull out there among them english . 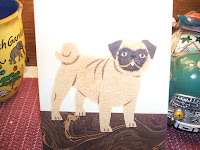 This is my pen pal barbs latest addition to my pen pal collection . I was thrilled when I got it because she obviously loves dogs as much as I do . Only I dont have pugs . I must admit though I did consider a pug before I got my two that I have . I love it . It seems she got quite a few of these out to ppl this wk . I love it . I hope barb had as much fun sending them and we did getting them . Thanks barb you really brightened my day with this card . be carefull out there among them english . Hi I have really been behind this week and got this in the mail from a dear holly over at sendsomething.net . she is a chef so I enjoy her letter emensly since I steal some of her cooking secrets . LOL just kidding not really . 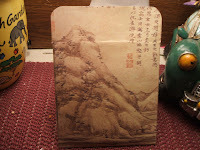 she sent me this envie with japaneese writing on it and inside were some little goodies too that will wait for one day when I dont have anything to blog about I will put those out and show them . well anyway I was thrilled about receiving this and do so love it . be carefull out there among them english . I have such a bone to pick !!! Okay I have such a bone to pick with the post office !!! they actually had the nerve to send an empty envie which their lousy machine tore which had 84 cents on it in order for it to be hand stamped !! what about that does the usps does not understand about the fact that the person put 84 cents on it , for it to be hand stamped !!! I think maybe they just get too busy to care sometimes . I mean if they tore the envie they should have to pay for what was in it . 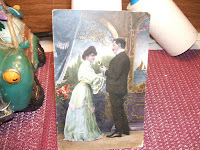 Of course that is my belief but apparently they would go broke cause they tear quite a few things they have torn so many postcards of mine that i have started asking ppl to please send postcards in envies to help protect them a little . I mean I know the post has a hard time already but honestly do you think that it is fair that they tear up our mail as well . I think maybe their machines need an overhaul at least and make sure what they are putting in those machines . oh well just my rant and rave for today !!! hey there I was going to blog about this yesterday but decided to blog about my mail instead . 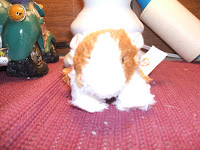 This is my mascot and he does not really have a name so I guess whatever we want to call him I am open to suggestions from my readers and followers .On occasion you will see him or pics of him on my blog and what ever the subject might be for that day . I try to entertain my readers and followers and give them something to make them say hmmm... and think a little . well that is it for today and remember same time , same channel tommorow . Take care and be carefull among those english out there . Many thanks to my friend Okami over at whatever . she is one of my followers and a pen pal . I love this postcard . I often wonder if I was born a couple of decades too late because I feel such an affinity for the vintage age such as shown in this postcard . I often also wonder what it would be like to be a time traveler and go back and visit different time periods in this world . I think and hope I get a chance to watch the time travelers wife that is coming out on the big screen soon . I have had the pleasure to see "somewhere in time with the late great christopher reeve and the awesome jayne seymour . I thought that christopher reeve showed alot of spirit in the face of adversity when a fall from a horse crippled him for life and he just kept going god bless him . Anyway this postcard got me to thinking about that . Thanks Okami and it will have a special place in my album . Same time , same channel tommorow and be carefull out there among them english . Knitting in the Wild - Life on Clear Creek: And yet another gifting! Knitting in the Wild - Life on Clear Creek: And yet another gifting! I posted about denises blog she is giving away a nice basket of yarn and also some nice soap . I know she does lovely knitting work and just look at her blog and see it . awesome lady if you ask me and she works hard at what she does . well guys come on and check it out . Knitting in the Wild - Life on Clear Creek: And yet another gifting! she is giving away a nice basket . she does lovely work . http://knitting in the wild-life on clear creek.blogspot.com . she is quite talented this girl and I very much admire her work and just recently discovered her thanks to some of the other blogger friends of mine . I love her work and would love to win her yarn basket and soap . I would die to smell her soap . LOL !!! Oh well dont have much else to say today . talk to all soon . same time same channel tommorow , be carefull out there among them english . 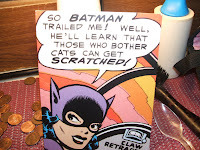 I got the catwoman card a couple of days ago and the caption on it reads:So Batman tailed me !! Well he'll learn that those who bother cats can get scratched !! Oh so true and my email name is catsmeow and I am allergic to cats as well . that tickles ppl to death when I tell them that . 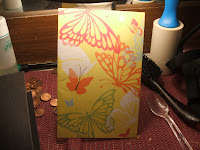 Now the beautifull butterfly card is just adorable and got it from my pen pal crystal in north carolina . I have a passion for butterflies I guess it is because they come in so many colors and see them everyday in my cousins yard . How vivid their colors are as well . so i guess you could say my nick name is catwoman and also used to be wonder woman and then marilyn monroe have had alot of nick names over the yrs and some not so nice !!! LOL !!! Take that last part with a grain of salt . same time same channel tommorow kids . take care stay safe out there among them english . Okay folks we need to start a major letter writing campaign or we are going to be driving at least an hr and a half to go to the post office . They are talking about shutting down some post offices . I say we need a major letter writing campaign and we need to get busy . 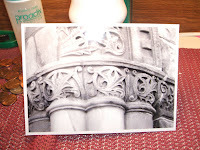 My dear friend Carla is also talking about this at her blog 365 letters . I say everyone who reads my blog would send out a letter one a day for the next yr just think how much we could put into the postal system and maybe stop this shutting down from happening . So lets get busy out there and bang out some letters . I want to see a major letter writing campaign happen in this country . wow I really feel bad now cause yesterday I misread someones blog and she wrote me and said why did you say I was sad ?, it was meant to be a nice blog not sad . Okay my bad . I appologized anyway . Then I read someone elses blog and was asked to give an opinion which i did ,but in all fairness I did state like my girl Wendy Williams says I like to be an opinion of many so I left my opinion . I must say though I think it was totally taken wrong and she did ask for it when she asked our opinions . I mean if everyone thought alike how boring this world would be . anyway I will write more later and see if the earth is any kinder to me later on . Check out the pen addict there is an awesome deal over there to win a fantastic pen . Just go over there and look at it . I love these awesome deals . Wow I am doing something a little different today . 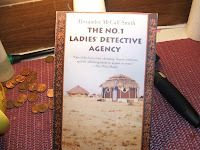 I usually blog about what I receive in the mail , I thought I would change things up and write a review on these books . They are the first two books in a series of four . I could not put these two books down after I started reading them . from cover to cover they had me captivated . If I had to reccomend them Oh yes absoloutly would and can . They are awesome and I hope to find the third and fourth book in this series . I know someone might be thinking that these books dont look like much but believe me when I say that they are very much worth the read . Well that is all for today folks . Same time , same channel tommorow . 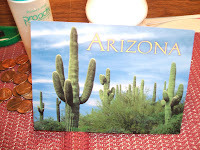 hi everyone well I got this awesome letter today from melissa over at welovesnailmail.com . If you guys have not checked it out do so cause this is an awesome site for all of us that love regular mail and love to have our mailboxes singing . 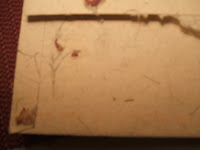 this envelope has rose petals enclosed into the fabric of the envelope . It was awesome and just great to receive such a wonderfull creative design as this and of course I must say thanks to melissa for this awesome letter and I knew when I saw this envelope this was far from ordinary . well that is all for today guys tune in tommorow same time , same channel . The photo one is from rebecca . the girl who teaches and turns her photos into postcards . the other one is from erika from atlanta who is going home soon to ky . I hope she stays in touch when she goes back . Love those vintage postcards . Have a good one everyone . hey there everyone well made a mistake with the arizona one and had already posted that . 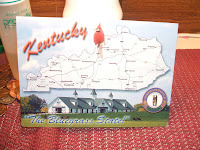 but the ky one is from my pen pal Juli . thanks Juli . 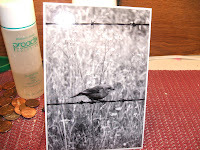 and the bird photo post card is from rebecca and she teaches at a college . 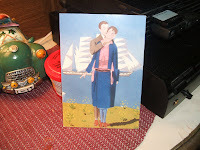 she turns her photos into postcards which i think is an awesome thing to do . This I got over the weekend and it is from dear sweet melanie from swap bot . I was thrilled to get it . Hi all I just got a pkg from the image shop . thanks to john for sending such nice stationery . You guys should take the time and check it out and look at the fine samples they have on their website . It is called theimageshop.com . It is an awesome place and the prices are awesome as well . This is a lazy saturday for me . It is a good day but kind of lazy and laid back day . well it is finally august which means that for some of us the summer is coming to a halt and the kiddios will be back in school . I dont have any small kids anymore and kind of glad the way the world is that I dont . I think if I did I would probably be a nervous wreck all the time and would not let them out of my sight . well glad to see the missive maiden back and hope her time of grief is a short one welcome back dear . well that is all for today kids talk to everyone soon .